Add $25.00 per wire grommet if required. Code “G”. Designer steel perforated modesty panel and steel perforated inserts avaiable. 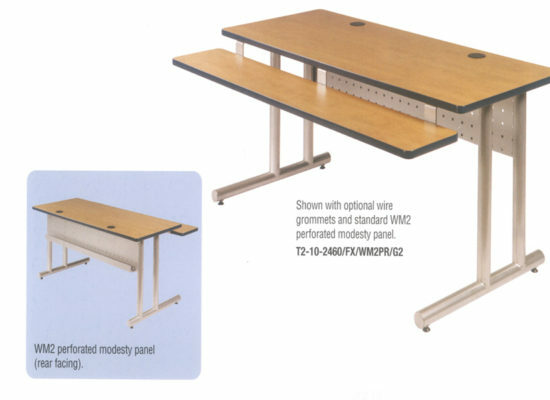 Add $40.00 (WM2PR) for perforated steel modesty panel(eg. 10-2460/FX/WM2PR). 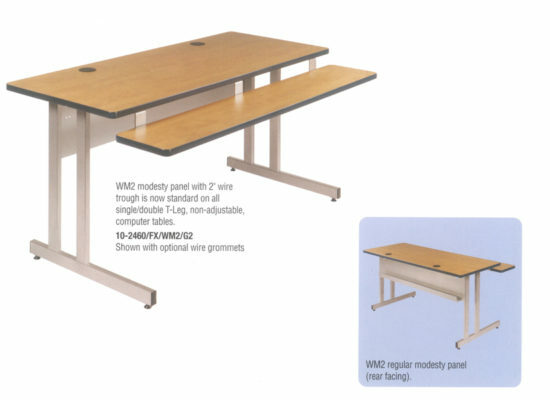 NOTE: FX tables are available with tubular double T-legs,and a perforated modestypanel. FX and multi keyboard T2 series of computer tables craete a unique look incorporating borh aesthetic and functional features into a practical and enduring design. Uprights forward, rear facing tough standard. Add $36.00 for perforated hybrid modesty panel/4″ wire trough. Code “HBPR”. Add $140.00 per perforated CPU holder. Code “CPU14PR”. NOTE: On FX tables uprights are always set forward/rear facing trough unless otherwise requested.